Abortion. Homosexuality. Environmentalism. Evolution. Conservative positions on these topics are the current boundaries of mainstream Evangelical Christianity. But what if the theological arguments given by popular leaders on these “big four” were not quite as clear cut as they claim? Growing up as an evangelical Christian, Jonathan Dudley was taught that faith was defined by the total rejection of abortion, homosexuality, evolution, and environmentalism. But once he had begun studying biology and ethics, his views began to change and he soon realized that what he had been told about the Bible – and those four big issues – may have been misconstrued. Broken Words: The Abuse of Science and Faith in American Politics assesses the scientific and cultural factors leading evangelicals to certain stances on each issue, shows where they went wrong, and critically challenges the scriptural, ethical, and biological arguments issued by those leaders today. 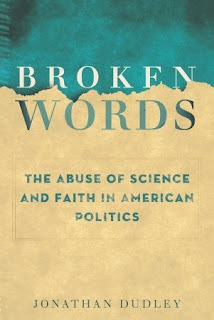 In Broken Words, Dudley applies the Bible and biology to challenge the fixed political dogmas of the religious right. Evangelicals are confronted for the first time from within their ranks on the extent to which faith has been corrupted by conservative politics, cultural prejudice and naive anti-intellectualism. A re-ordering of American Christianity is underway – and this book is an essential part of the conversation. Who would have a better idea about the views of certain religious sectors than someone who has experienced them? This author has a good balance of what applies as a religious aspect and what is more cultural or should be addressed with science in mind. This author heavily promotes science and logical thought, the reader will likely find his arguments engaging and interesting. The reader will likely admit his arguments contain merit. Can political forces manipulate religion in their favor? Of course! The author explains his views on this clearly and expertly to the reader. His opinions are kept at that-opinions. He does not push the reader too much to accept his opinions, though he does use scientific theories-ones that the reader would be hard pressed to deny. Overall, this book was very informative and analytical-this book is not meant to be an easy or light read. The book is best for adult readers.